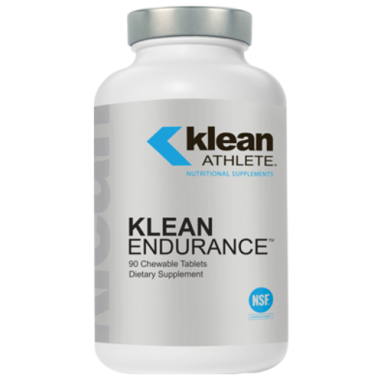 Klean Endurance by Klean Athlete is an all natural D-ribose chewable supplement to help maintain performance in extended high intensity workouts. D-ribose is a natural pentose sugar that creates ATP (adenosine triphosphate) for the support of athletic performance and energy production. It has been reported in athletes it can take up to three days to restore ATP levels back to baseline levels after intense physical exercise. Ribose supplementation has shown to increase the rate of ATP synthesis following intense physical exercise, decreasing overall recovery time as it provides muscles the energy needed to restore themselves to a normal state. Suggested Usage: Adults: Take 2 tablets per day with food, a few hours before or after taking other medications. Non-medicinal Ingredients: Xylitol, cellulose, hydroxypropylcellulose, natural orange and vanilla flavours, citric acid, mannitol, vegetable stearate, stearic acid, natural palm wax (Copernicia prunifera), and silica. Caution: Do not use if you have primary systemic L-carnitine deficiency or secondary L-carnitine deficiency (inborn errors of metabolism) for which supplementation is prescribed or monitored by a healthcare practitioner. Consult a health care practitioner if you are pregnant, breastfeeding, if you have liver or kidney disease, if you have diabetes, or if you have been instructed to follow a low protein diet. Feelings of sleeplessness or overstimulation may occur; if feelings persist or worsen, discontinue use. Stomach/abdominal pain has been known to occur, in which case discontinue use.